What if we tell you that today — thanks to Technology — we now have floating speakers? Yes, it took us by surprise too until we got to try some of them, and it surprised us even more with how amazing they are. Therefore, we recommend you getting one of these speakers as well. In order to help you pick one of the best floating speakers in 2019, we have crafted a list of the top-rated floating speakers for you to choose from. At first glance, this gorgeous ice orb floating Bluetooth speaker is already fascinating. It is a floating speaker that spins above a magnetic base. Built with a special sound guide cone, the Bluetooth speaker can increase the 3D surround affect better than ever. Any smart phone or smart device with the NFC function can be paired with it easily. At night, the speaker shows its neon colors magically. After all, who doesn’t love a globe Bluetooth speaker that levitates? As minimalists, this design and color really feed our souls. In grey, the Mars craft floats elegantly in space with the unique automatic launch and land levitation system. It becomes alive with the 8-hour battery life. Using the Crazybaby app, connecting the speaker to your smart device is very simple. Entertain your cerebral lopes with this powerful thing. Next, we would like to introduce to you the B4M Floating Maglev speaker. If you love a combination of black and red colors, this should be what you’re looking for. 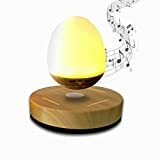 Of course, this floating speaker orb spins above the magnetic base while producing a beautiful sound. Any smart phone or smart device that has the NFC function can be paired with the speaker. Now, you can enjoy music even better – thanks to the mysterious black levitating orb! Equipped with a microphone, this floating wireless speaker also allows you to enjoy hands-free conversations. Interestingly, this one has a 360 sound projection, producing louder sound with stronger bass. And, with it, the LED effects/lights will bring your favorite tunes alive. Its small size, fitting the palm of your hands, makes the Bluetooth speaker super lightweight, and portable. 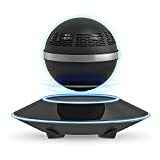 Here is another floating speaker that also spins above a magnetic base. This is such an innovative and attractive design that everyone adores it. The speaker is not just a simple portable speaker, but also a smart phone charging-hub. The crowd will be pleased by its look as well as its performance of a 360° sound distribution. Because a touch of green will always lift up your mood! Is it true that Star Wars fans have been longing for a Star Wars floating Bluetooth speaker? At least, we are one of them. 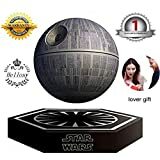 The most charming affect of this floating Death Star speaker is the flashing effect that makes it look like at luminous dreamlike planet in the vast universe. It also does all the jobs that the previously reviewed floating speakers do – wireless connection to smart devices and awesome surround sound. We still have more good news for our fellow Star Wars fans. Hellosy produces more than one Death Star levitating Bluetooth speaker. The LED light of this speaker is even more realistic and vibrant than the previous one. And, indeed, it plays beautiful music wirelessly just like the other ones. Besides, it is a great conversation piece, too. This is a maglev floating Bluetooth speaker from Nasky. Looks like an egg, but it is a pod-shaped speaker. Some of its top features include lightweight, portability, long battery life and playtime, and, of course, the ability to play music through Bluetooth. For sound quality, the Bluetooth speaker provides tuneful deep bass music with 360° sound as well. With this look, we think the speaker is more suitable for bedside lighting, yoga sessions, and meditation than any other activity. The next item that we love is the Uppel portable floating speaker. It is a ball-shaped one that has very similar features to the other top speakers. But, it appears to be more affordable at the moment. Therefore, the speaker also floats, connects to your mobile phone, and provides the best sound quality. Get the party started with the Upperl Portable Floating Speaker today. 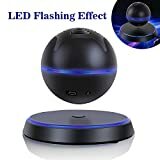 Lastly, we would like to introduce to you another orb floating Bluetooth speaker from Ice Harmony. 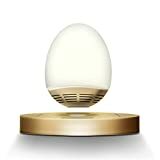 Get ready to be amazed by how this item illuminates every time the levitating part is switched on. For construction and appearance, it has a cushion petting and warm golden glow that surely makes our heart pounds. Be it for bedside lighting, meditation, yoga sessions, or music playback, you can always have faith in this magical floating Bluetooth speaker! Did any of the above-reviewed floating speakers get your attention? We believe that this is the ultimate list of the top 10 best floating speakers that you can come across. You don’t need to do any further research at all. So, it is better for you to just simply settle for one of these top-rated floating speakers on the market today.